We filmed a short video for this recipe. You can view it below. For more video updates, you can subscribe to my You Tube Channel. 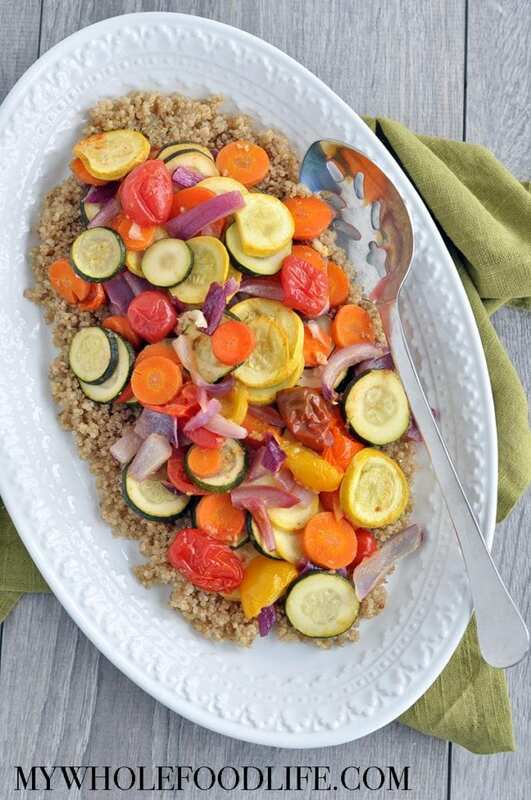 This Roasted Vegetables with Quinoa is a great way to use leftover vegetables. Vegan and gluten free! On a baking sheet , add all the ingredients except the quinoa and cover. Cook in the oven for 40 minutes stirring at least once. In a small pot , add the quinoa and water and bring to boil. Once the water is boiling, reduce heat to medium-low and let simmer covered for 7 – 10 minutes or until quinoa is cooked and soft. Once the veggies and quinoa are done cooking, mix in a large bowl and serve. Keep this in the fridge. It should last at least 5 days. Enjoy!